A new project that will bring a high-power electric vehicle charging network from late 2018 is now underway. Building on existing V2G work between Italian energy company Enel and Nissan, the project also includes Renault and utility firms EDF, Enedis and Verbund as well as Spanish recharging firm IBIL and will initially install 14 charging stations, covering eight in Italy, four in Spain and two in France. Stations will have a capacity of between 150kW and 350kW and will be located along motorways and expressways. The project will have a budget of €6.9m. of which half will come from the European Commission’s Connecting Europe Facility (CEF) for Transport programme. The project comes as Dutch charging firm Allego along with Nordic charge point operator Fortum Charge & Drive works on developing a pan-European interoperable charging network, focusing on metropolitan areas and along highways. 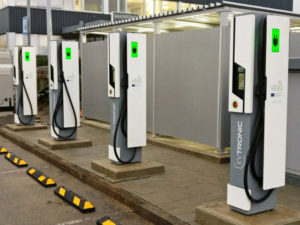 Meanwhile the manufacturer-backed pan-European Ionity network is planning to roll out 400 sites on major routes by 2020 while utility company Eon is to install a network of 10,000 charging points across Europe. Groupe Renault has also partnered with the Ultra-E and High Speed Electric Mobility Across Europe networks in northern Europe, comprising 25 and 158 charging stations respectively.